Tour Windsor's downtown shops and breweries with the complimentary Windsor Hopper Shuttle. Sonoma County's newest complimentary luxury shuttle in town has been extended through the summer. The Windsor Hopper, a complimentary daily shuttle, debuted Feb. 1, coinciding with Russian River Brewing Company’s release of their iconic Pliny the Younger for the first time at the brewery’s new Windsor location. 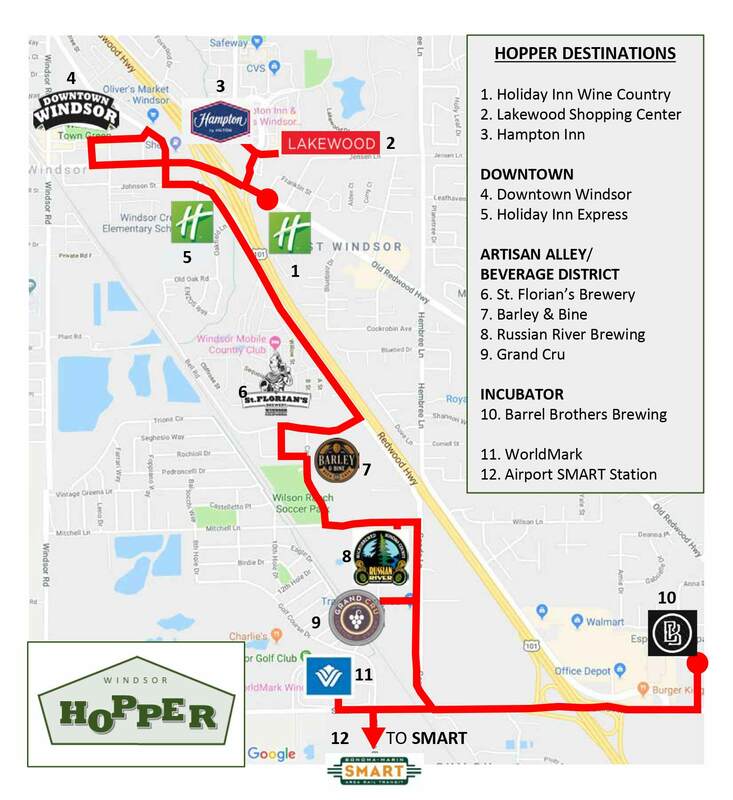 The Hopper runs Thursday through Sunday and offers rides to craft breweries, award-winning wineries, and restaurants from family friendly to international cuisine. It also gives visitors and locals an opportunity to get off the shuttle and explore Windsor’s downtown, with its charming shops, cafes, and the popular Town Green. Download the Windsor Hopper map here and schedule here. The Pure Luxury-operated shuttle stops at Downtown Windsor, St. Florian’s Brewery, Barley & Bine, Russian River Brewing, Grand Cru Custom Crush, Barrel Brothers Brewing, as well as hotels and shops. Best of all, its schedule is synchronized with that of the SMART train. Visit www.townofwindsor.com/hopper for more information.